Guatemalan Hand Crafted Light Green Jade Earrings, "Forest Princess"
Surrounded by sterling silver petals, light green jade is beautiful. Zandra Lorena Sajbin sets the round gems in beautiful and modern button earrings. 0.5 cm H x 1.2 cm Diam. 0.2" H x 0.5" Diam. 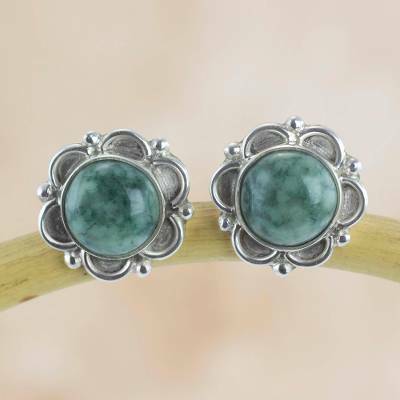 You can find jade flower earrings 'Forest Princess' by Zandra Lorena Sajbin in jewelry categories such as Floral Earrings, Jade Earrings, Silver Earrings, Sterling Silver Earrings and Button Earrings. Enjoy exploring these sections for other Novica treasures. From a humble artist to a respected member of her community, Zandra captures the spirit of the Women's Empowerment badge. "After my husband died in 2017, I knew I would need to provide for my three children. I've made their education my top priority and plan to send each of them to university. I have also welcomed helpers into my workshop, and support them with fair wages," she says. Zandra started off as a humble artisan with a strong passion. Since her start with NOVICA, she has been able to grow her workshop and achieve more than she thought possible. She is able to support her children, create jobs in her community, and has become one of the most respected artisans in her city. Zandra Lorena Sajbin has received 9 microcredit loans with 0% interest from Kiva and Novica, the first for $1050 and the most recent for $3500. Proceeds were used to invest in the purchase of more silver, jade and tools so she can develop her new designs. Zandra lost her husband in 2017 and she is now the sole provider for her three children, Fabricio, Alejandro and Dulce. Through her jade jewelry art, she is able to support her children and increase their livelihood. Zandra financially supports her three children's education and plans to send the three of them to university as well. Earings arrived in cute pouch with personal note. Exactly as described. Love them ! I didn't realize how small the jade earrings were. In the picture they appear much larger and the jade was much more colorful. It would be better if they would show a picture of a person wearing them to see how they would look on. Workman ship was good but I feel the choice of jade and size of earring was too small and was a disappointment. These earrings are smaller than I thought they would be, but they are well made and lovely. I got them as a gift, but would like a pair myself. I love the love and care that went into these exquisite earrings.They came in a quaint little bag with a little doll attached.Beautiful!They arrived sooner then l thought they would! You're very talented! Will be buying from you again ?? The ring is beautiful and well made. Now I want the bracelet !! Estimada Zandra, he recibido el pedido y estoy encantada. Un trabajo excelente, precioso. Seguro que vuelvo a comprar alguno de tus tesoros. Un saludo.